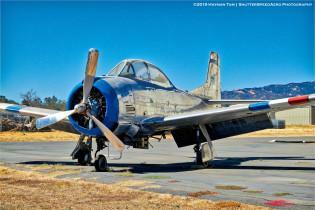 Spotted this T-28 on the apron outside the Center for Freedom & Flight, an aviation museum located at Nut Tree Airport in Vacaville, CA. The Trojan is a 1950’s era training aircraft that was used by the Air Force and Navy, along with armed forces around the world, and eventually replaced by the T-34C Mentor. The T-28 saw combat roles in Vietnam and Laos after being modified to carry weapons and ordnance. Fuji X-E2s w/18-55mm.